Create sophisticated interactive multimedia applications without any complicated programming. MaxMedia is a multimedia authoring system that allows you to combine graphic, image, photos, text, sounds, MP3, video, flash, animation, html and other elements to create: multimedia presentations, digital album, interactive kiosks and catalogs, cd-cards, cbt, educational games and materials, e-books, screen savers, interactive CDs and more. Create sophisticated interactive multimedia applications without any complicated programming. 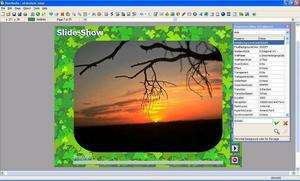 MaxMedia PRO 2.2.00 is a shareware program and can be used as a demo to try the software until the free trial period has ended. A full version of the program is available after the trial period ends. For security reasons, you should also check out the MaxMedia PRO download at LO4D.com which includes virus and malware tests. Additional screenshots of this application download may be available, too.